Sit down with me. 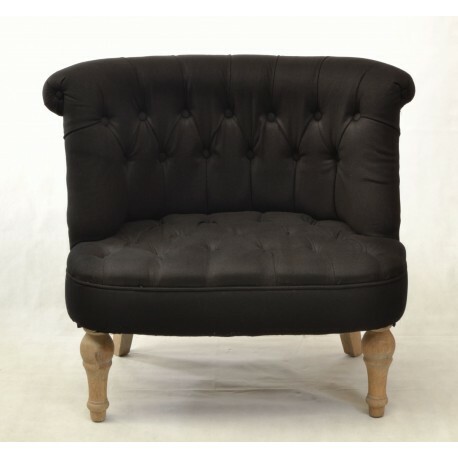 The black occasional cosy chair is a more substantial bedroom chair or accent chair. With the same style as the black occasional chair just slightly bigger. Made with a solid wood frame and with the black buttoned upholstery this is a fantastic bedroom chair or accent chair. The black is contrasted by the pale legs giving a wonderful lift to the finish. The traditional feel of this upholstered bedroom chair is completed by the buttoning and turned front legs. All this is contrasted by the contemporary black linen finish. This style if anything adds to the comfort of the chair with the scroll back having a gentle curve to give a full support. The underlying solid wood frame gives you a chair to last. Used as a contemporary bedroom chair or an accent chair in a lounge you can combine this fantastic chair with many different styles.